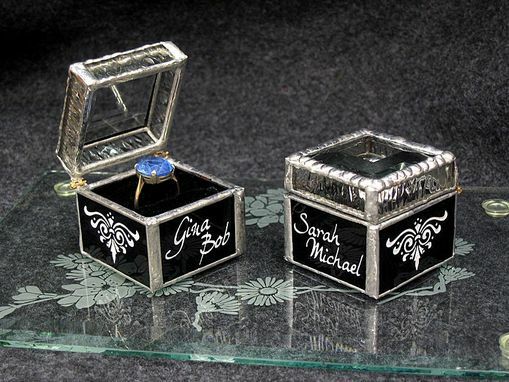 Personalized custom ring boxes made with passion for your precious love. Precious custom made ring boxes, crafted with black glass and a hinged clear beveled lid. They are delicately etched with a Victorian flourish on each side ond the first names of the bride and groom on the front panel. The boxes measure 1-3/4"x1-3/4"x1-3/4". They are lined with black velvet to offset the beauty of an engagement ring or wedding set. Truly ideal gifts for the precious love in your life. Dimensions: 1 3/4"x1 3/4"x1 3/4"